Spring is one of my most favourite times of the year because the sun starts to shine more often, the air is fresh and we start to get excited about Farmer’s Markets! This week, I wanted to go through a list of foods that are available in the spring along with their health benefits. Before I get started on that though, I want to make sure to mention that I believe in a balanced approach when it comes to eating real food. I don’t believe in a one size fits all food that will cure disease or make you super healthy (Eat kale and live to 100!!). Instead, I believe in eating a wide variety of nutritious foods each day to give our bodies optimum nutrition from various sources instead of relying on only one source. Not too much produce is available locally in the spring, but what is available is packed with nutrition that our bodies need after a long winter of cooked root vegetables. One vivid memory I have from childhood is going into my Aunt Carole’s garden to cut a piece of rhubarb and eat it raw with white sugar. It was the perfect combination of sweet and sour. Tons of fibre (5 grams of fibre for a 3.5 oz serving). Used in Ancient Chinese medicine to sooth upset stomach and help with constipation. Every serving provides 45% daily value of Vitamin K which helps with bone strength and brain health. Also includes Vitamin C, Vitamin A, calcium, folate and B vitamins. I’ve noticed that strawberries are available at places like Farm Boy throughout the colder months because they are now grown in greenhouses in western Ontario. The great news is that greenhouse strawberries use ‘beneficial insects’ to kill pests which means that fewer pesticides are used compared to their conventional counterparts. One thing to note about strawberries overall is to buy organic if you can. According to the Environmental Working Group, strawberries are at the top of the Dirty Dozen list for pesticides. High levels of vitamin C (use those greenhouse or organic strawberries in the winter to boost immunity). Super important for heart health due to the high antioxidant content. Each cup provides 24% of manganese which helps with bone production, collagen production, blood sugar control and free radical damage protection. Strawberry seeds contain a small amount of Omega-3 fats. Help to prevent cognitive decline as we age. I try to eat asparagus only when it’s in season, otherwise it comes from Mexico, which means it’s not fresh (We want to eat asparagus within 48 hours for optimum nutritional benefit). Asparagus is a perfect spring treat and it has a ton of health benefits. Note! Asparagus doesn’t take as long to cook as you might think. Steam or lightly sauté the spears for only 3-5 minutes. Say no to soggy asparagus! 101% daily value of Vitamin K per cup serving (Vitamin K is important for blood clotting and bone health). Also high in folate which is good for brain and nervous system health as well as cardiovascular health and red blood cell production. 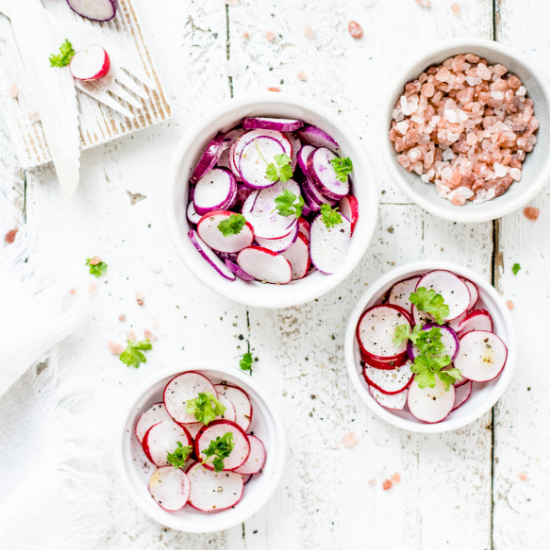 People have a love hate relationship with radishes. They’re spicy and kind of weird, but I tend to like them all the same. They’re also super healthy to eat! Helps to detox the body of toxins. Excellent for helping to regulate diabetes. The bulk of the produce bounty will come closer to the end of spring and summer, but get a head start by adding these spring fruits and vegetables to your daily meal rotations to get the biggest bang for your buck when it comes to your health! What are your favourite spring foods?